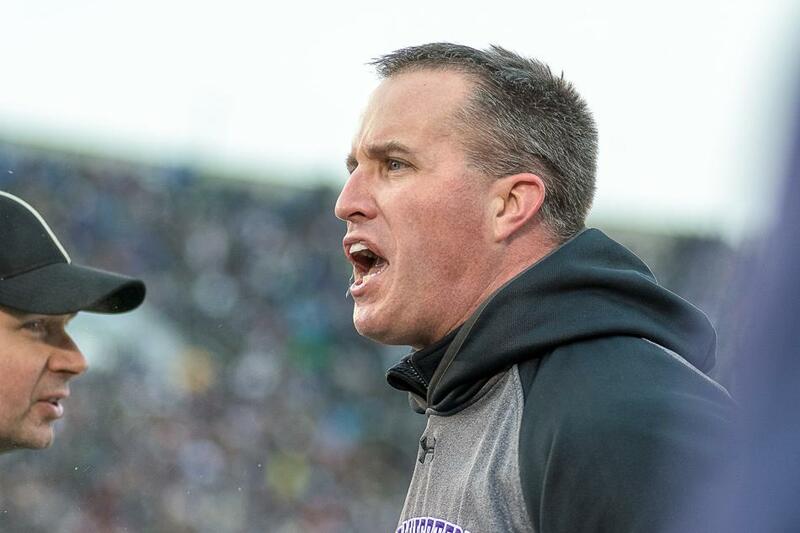 Coach Pat Fitzgerald has not been pleased with his team’s maturity this season. Fitzgerald said he blames the recruiting process for inflating players’ egos. All season, coach Pat Fitzgerald has alluded to “maturity” issues when diagnosing Northwestern’s on-field struggles. After practice Wednesday he addressed the subject in more detail. Fitzgerald said the Wildcats’ young players sometimes lose focus from play-to-play and make mental mistakes as a result. One root of that “immaturity,” the coach theorizes, is the rise of online recruiting sites that write about players before they reach college. In recent years NU has attracted recruits with higher national profiles, drawing “four-star” recruits to Evanston at a much higher rate than ever before. As Fitzgerald sees it, players come in overconfident, feeling they don’t need to work as hard as they should. In the past, Fitzgerald has shied away from playing true freshmen but this year has relied on running back Justin Jackson, tight end Garrett Dickerson and defensive end Xavier Washington. Meanwhile two redshirt freshmen, safety Godwin Igwebuike and linebacker Anthony Walker, have received substantial playing time, and others have assumed prominent back-up roles. Younger players have seen increased roles on the Cats’ depth chart for two reasons: 1) Injuries have created lineup holes on both sides of the ball and 2) Recruiting more talented players means having young guys who, in theory, require less development. Of course, NU isn’t the only school to play highly ranked recruits right away, but it is less experienced in integrating talented freshmen than schools that have traditionally excelled in recruiting. Fitzgerald acknowledged that the coaching staff hasn’t done a good job ensuring these young players possess the proper maturity. Senior defensive tackle Chance Carter said Wednesday he hasn’t noticed the immaturity Fitzgerald has discussed but admits he’s mostly focused on his own unit. If maturity is truly an issue with the Cats, the players’ preparation for Saturday’s game at Purdue could provide an interesting test. The “smoke blown up their rear ends” Fitzgerald alluded to in the recruiting process might be matched only by the smoke blown up their rear ends after last week’s overtime victory over No. 18 Notre Dame. Though the concept of a “trap game” or “letdown game” is somewhat dubious statistically, it’s possible a team that struggles to focus week-to-week would come out flat after being celebrated all week. Fitzgerald said competition is key to players’ development, humbling them a bit and motivating them to focus snap after snap. NU’s maturity problems, the coach said, will be settled in the off-season when everyone is healthy and playing time is up for grabs. Fitzgerald said he and the coaching staff haven’t been fueling any egos and won’t start now. “They’re not getting smoke blown from us,” he said.